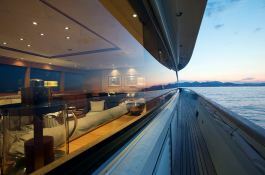 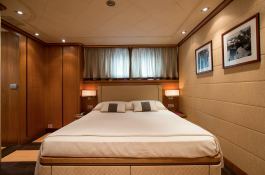 The motor-yacht Cappuccino was built in 2007 by Tigullio and can accommodate up to 12 guests in 5 cabins, including a Master, one double cabin, and 2 doubles, each with 2 pullmans. 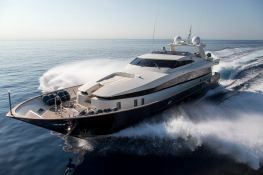 She has a crew of 5. 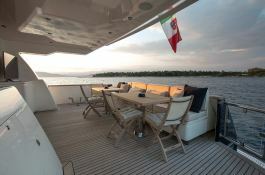 Cappuccino offers a spacious double aspect exterior lounging and relaxation area, the upper level of which boasts ample comfortable seating and al fresco dining. 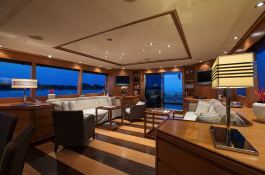 Cappuccino, built in 2007 by Tigullio, and refitted in 2014 is a fantastic 32M motoryacht which welcomes up to 12 guests on board with a crew of 5, and can reach a cruising speed of 26 knots thanks to its 2x2300 hp engines. 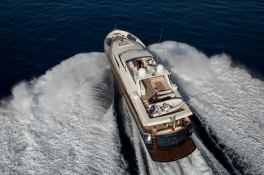 This Tigullio Yacht 32M is available for luxury charter around Corsica, France, Liguria, Naples, Rome, Sardinia and Tuscany. 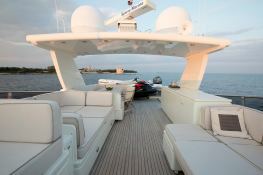 Cappuccino is equipped with zero-speed stabilizers and also jetski, waterski, DVD and Sat TV for a great luxury charter experience. 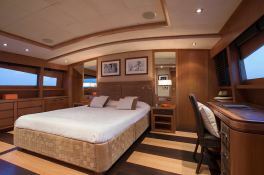 Cappuccino is available for yacht charter with a base price of 65 000 € (approximatly 73 304 $).